Molecular dynamics simulations reveal the conformational dynamics of Arabidopsis thaliana BRI1 and BAK1 receptor-like kinases. Journal of Biological Chemistry, 292, 30, 12643–12652, 2017. The structural motifs responsible for activation and regulation of eukaryotic protein kinases in animals have been studied extensively in recent years, and a coherent picture of their activation mechanisms has begun to emerge. On the other hand, non-animal eukaryotic protein kinases are not as well understood from a structural perspective, representing a large knowledge gap. To this end, we investigated the conformational dynamics of two key Arabidopsis thaliana receptor-like kinases, brassi- nosteroid insensitive 1 (BRI1) and BRI1-associated kinase 1 (BAK1), through extensive molecular dynamics (MD) simulations of their fully phosphorylated kinase domains. 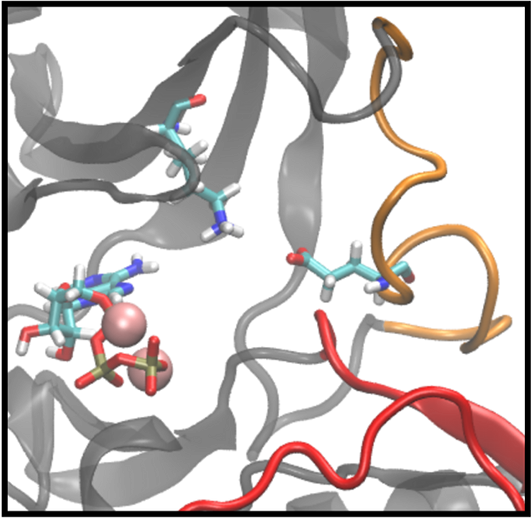 MD simulations calculate the motion of each atom in a protein based on classical approximations of interatomic forces, giving researchers insight into protein function at unparalleled spatial and temporal resolutions. We found that in an otherwise ″active″ BAK1, the αC helix is highly disordered, a hallmark of deactivation, while the BRI1 αC helix is moderately disordered and displays swinging behavior similar to numerous animal kinases. An analysis of all known sequences in the A. thalianakinome found that αC helix disorder may be a common feature of plant kinases.